An Indonesian Boeing 737-300 collided with a deer on takeoff from Pontianak Airport (PNK), according to a preliminary report issued by the Indonesian National Transportation Safety Committee (NTSC). On Novemer 22, 2012 a Boeing 737-300 aircraft registered PK-YVZ was operated by Batavia Air, as a scheduled passenger service flight Y6-206 from Pontianak Airport (PNK/WIOO) to Jakarta-Soekarno-Hatta International Airport (CGK/WIII), Indonesia. There were two pilots and four flight attendants with 112 passengers on board. The Captain was the Pilot Flying (PF) and the Copilot was the Pilot Monitoring (PM). As the airplane was just about to lift off from runway 15, the flight crew heard a ‘bang’ followed by aircraft vibration and a swing to the right. The Captain decided to continue the take off. After selection of the landing gear handle to the up position the flight crew noticed that the left hand main landing gear red light was still illuminated. This did not change after recycling the gear. The engineer checked the left hand main landing gear position visually through the viewing window in cabin area and found that the landing gear was in the up position. The Pontianak Air Traffic Controller (ATC) reported that the aircraft hit a deer during take off based on the evidence there was a deer’s meat and head found by the airport safety officer near the taxiway D of runway 15/33. The flight crew decided to continue flight to Jakarta. 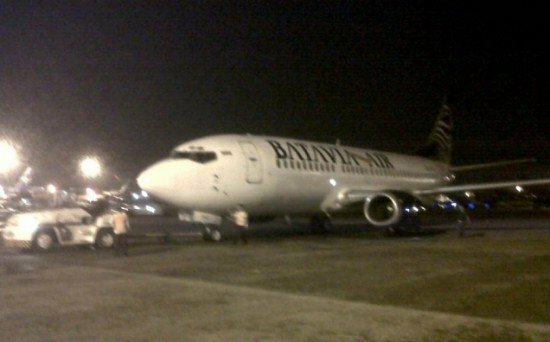 At 19:15 the aircraft landed normally on runway 25L at Soekarno Hatta Airport. As soon as the aircraft rolled down the runway the aircraft experienced heavy vibration and aircraft moved left and right of the centerline. All occupants were not injured and the aircraft suffered minor damage. The damage consisted of a broken left main gear shimmy damper; a broken left main gear lower torsion link; a missing left main gear inner door; and some damage to panels.